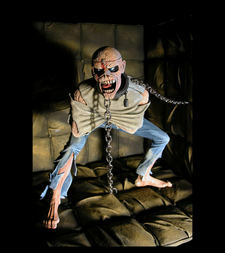 Let the Metal Gods smile down as NECA joins forces with legendary British band Iron Maiden! You know Iron Maiden, or if you don’t, you should. They’ve been a band for 35 years, they’ve released some of the most classic metal of all time, and their mascot, Eddie has been reinvented more times than Madonna, gracing album after album with his mutilated grimace, delighting generations of headbangers all across the world. First up is our Piece of Mind Eddie 7″ action figure, which comes in a straight jacket with a padded cell diorama based on the now-famous album cover. Eddie has a ball-jointed neck and torso and comes with real metal chains. No less would do for an album so metal! Next up, for those for whom owning Eddie simply isn’t enough and they have to actually become him, we have a brand new latex mask! Based also on the Piece of Mind cover (that classic snarl), this highly-detailed sculpt captures all of what makes Eddie such a beloved figure in metal. Great for Halloween, your next Maiden show, or for display in your home. The Eddie figure and mask will hit stores in September and will also be featured on our Amazon storefront . 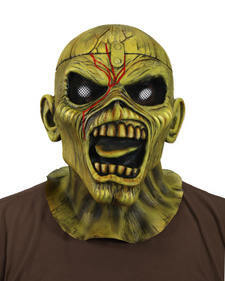 Keep it tuned to necaonline.com for more info on Iron Maiden and other lines from your favorite games and movies.